Four key issues that will need to be resolved for the neighbours to normalise relations. 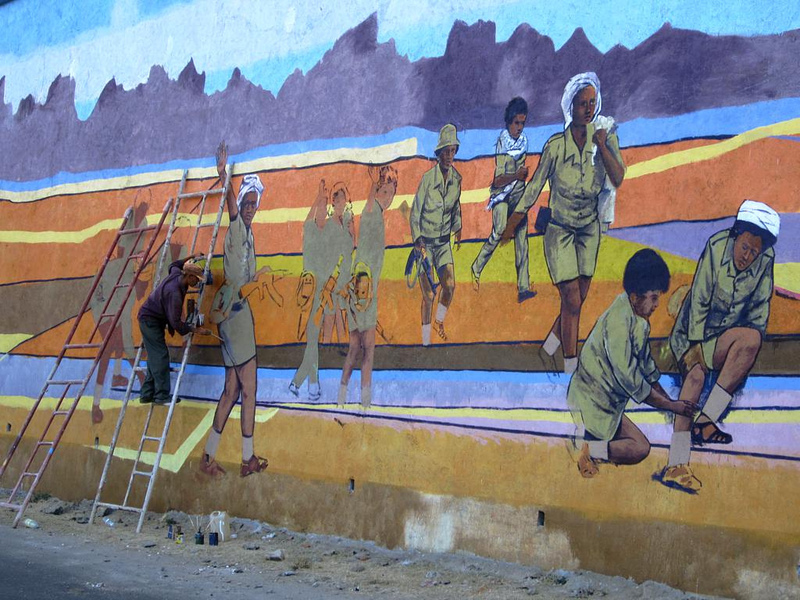 An artist in Eritrea paints a patriotic mural of the war. Credit: David Stanley. In 1991, as the US Assistant Secretary of State for African Affairs, I led peace talks between Ethiopia and Eritrean separatists. The negotiations ended a nearly thirty-year war and established Eritrea as an independent state. These outcomes were a geopolitical success, but they did not resolve the bitter acrimony between the two countries. And since that moment, the relationship between these neighbours has been frozen in hostility. It has included a 1998-2000 border war, shadowy intelligence efforts, and accusations of tacit support for rival militant groups. Both sides have maintained a heavy and expensive military presence along their border, and a once vigorous economic relationship has totally dried up. Yet a détente may finally be emerging, driven by the arrival of a new Prime Minister in Addis Ababa, Abiy Ahmed. On 6 June, the Ethiopian government announced it would finally implement the 2000 Algiers Agreement, an internationally sponsored peace treaty and border demarcation signed by Ethiopia and Eritrea. “All that we have achieved from the situation of the last 20 years is tension,” Abiy later remarked. “We need to expend all our efforts toward peace and reconciliation and extricate ourselves from petty conflicts and divisions, and focus on eliminating poverty.” The prime minister referred to Ethiopians and Eritreans as “brotherly peoples” and expressed hopes for “economic ties between Asmara and Addis Ababa”. The centrepiece of this move is the highly symbolic town of Badme, a disputed territory which Ethiopia illegally occupied in 1998, sparking the border war. As part of the peace agreement, a Hague commission declared Badme part of Eritrea, but Ethiopia never accepted this decision and continued to occupy the town. Ethiopia’s pledge to cede Badme to Eritrea is therefore deeply momentous. Eritrea has consistently stated that all issues would be on the table for negotiation as soon as Ethiopia withdrew from Badme, a symbol of Eritrean resentment since the last war ended in 2002. This means that, in theory, the door is now open for bilateral discussions. It is hard to overstate how positive a friendly relationship between Ethiopia and Eritrea could be for the region, which has been dogged by poverty, famine, and insecurity. It is too early to say if and when such talks could be held, but these are the key issues that would need to be resolved as priorities for the partnership to move forwards. Since the end of the war in 2000, Ethiopia and Eritrea have accused each other of supporting “opposition groups”, both armed and unarmed. It is difficult to confirm or deny their allegations, but it is clear that the first order of business should be a mutual security guarantee. Both governments should agree not to allow their territories to be used for hostile activity and pledge to reduce their military forces along the border by 80%. The two defence establishments could then begin discussions on joint actions against “jihadist” militants threatening the security and stability of both Ethiopia and Eritrea. Prior to the war, Ethiopia and Eritrea enjoyed what was essentially a common market. Cross-border trade flowed freely, with neither tariff nor non-tariff barriers. Eritrea’s introduction in 1997 of its own currency, the Nakfa, made cross-border trade more complicated, but had little impact on commerce. Ethiopia’s later insistence that cross-border trade be conducted in US dollars created an additional impediment. The two governments should now declare that the border will re-open to commerce with no barriers. To overcome the inhibiting factor of US dollar trade financing, the governments can jointly request that the International Monetary Fund establish a currency-clearing mechanism allowing businesses to pay for goods in either country’s local currency. The IMF has established several such mechanisms in other regions of the world. Prior to the war, Ethiopia had full access to the Eritrean ports of Assab and Massawa. Ethiopia had its own customs facility in Assab where they cleared imports destined for its markets. All of this was interrupted by the war. After Eritrea gained independence in 1993, Ethiopia became landlocked and had to rely exclusively on the railroad from Addis Ababa to the port of Djibouti, bypassing Eritrean territory. There is no reason why the normalisation discussions could not arrange for a restoration of Ethiopia’s access to Eritrea’s two ports. An existing high-quality road from Massawa port to Ethiopia could serve northern Ethiopia. The Assab port meanwhile is relatively close to the capital Addis Ababa. Under such an arrangement, Eritrea would gain revenue from Ethiopian rental payments. Ethiopia would gain more efficient movement of imported merchandise and aid. In addition, Ethiopia would no longer have to rely exclusively on the distant port of Djibouti and the less-than-reliable railway connection. The UN Security Council imposed sanctions on Eritrea in 2011 based on some weak evidence of its alleged support for al-Shabaab militants in Somalia. Since the allegations against Eritrea are now old and there is no evidence of recent activities, it would be appropriate for Ethiopia and the US to jointly sponsor a resolution in the Security Council to lift these sanctions. The new regime in Ethiopia has brought fresh hope of a healthy and stable relationship with Eritrea. The two governments undoubtedly have additional issues they will want to raise during discussions. But if they start with those above, they will be well on their way to a win-win outcome. You, of course, had a hand in the mess. At the London Conference you sat between Isaias and Meles; you already had your mind made up as to the outcome and had the temerity to cut the meeting short! Future generations of Ethiopians will not forget that! In the meantime, Tigray Front has come out with a communique of its own today following a three-day emergency meeting. Two gripes, that the olive branch extended to Asmara and the privatization scheme are both “fundamentally flawed.” Hence, an emergency meeting with the three other parties must be called! The allusion to “privatization” is just a cover for what is really irking Tigray Front leaders. Why the call for emergency meeting now when it was Tigray Front (with Meles as leader) that initiated the war that claimed close to 80,000 lives, deliberately failed to defend Ethiopia’s rights, and took a no-war, no-peace stance? Why was Prime Minister Abiy asked to resolve the border issue with Eritrea when he visited Tigray immediately following his inauguration? It is because the people of Tigray are agitating and challenging their leaders as never before after realizing border areas will be ceded to Eritrea and communities will be divided. Tigray Front leaders Seyoum, Seye, and Tsadkan, etc, are warlike once again, threatening, and lying to any one who would believe them. And trying hard to make scapegoat out of Prime Minister Abiy especially and the other three parties. Let me hazard a guess. Tigray Front was fast losing face and power in Ethiopia. Border demarcation with Ethiopia was deliberately left to smolder. Picking it up now is a way to create a distracting agenda that (it is hoped) will extend Tigray Front’s power and get it to set the agenda. Well said mr Cohen. Keep up the good work on trying to help these two brotherly people to peace. thank You Mr. Ambassador for your brief explanation of facts and suggestions to bring peace between Eritrea and Ethiopia. We all are waiting FOR THIS MOMENT TO HAPPEN AND to resume life once again. We have to give chances for the people affecting by the conflict they know their border befor the conflict. These is the main eritating & demonstrating. Which one of them is distant Djibouti or Asseb/Massewa? and distant for whom? Your point is clear and supportive to the people of Ethiopia and Eritrea. God help the people of the two countries to understand and respond positively to the good news on normalization and peace. The people should know well, those who beat drum of war but were never ever affected by the bloody wars waged in the name of unity. 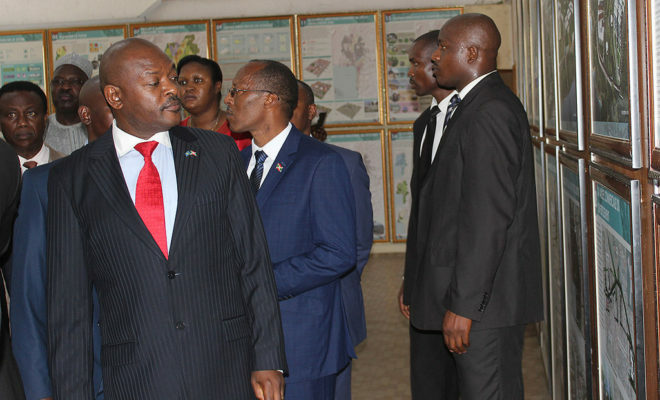 Unity could be possible by building confidence, ensuring justice and economic development and integration. The people of the two countries should give no no no space to war mongering blood thirsty elites or leaders. We need leaders that bring us together willingly, friendly, peacefully and thoughtfully. God willing this will happen sooner than later. God bless the people of the two countries!!! Well, this puts Isaias Afewerki in checkmate. No matter what decision he makes either way, it will work against him and could potentially lead to his fall. The “no-peace no-war” status has served him well. It has kept the Eritrean population distracted from demanding more from their leader in a unified manor. He used it as propaganda tool to inject fear as well as to keep their focus of off him…. If he refuses the peace offer, it will be impossible for him to come up with a convincing argument given the fact that he has been asking for this for years. He will loose the few supporter he has in and out of Eritrea. This will also be a major set-pack for Eritrea and major victory for Ethiopia diplomatically in the eye of the international community……. Let say he accepts peace offer and he normalizes relations with Ethiopia. This too is trouble for him. Soon after, Eritreans will start to demand more from him. At the moment the population is bombarded with misinformation as to why there is no democracy, no election, no free press and not to forget the mass conscription of the younger generation. All is because of the boogie-man (Ethiopia) that is coming to get them. He has convinced a good portion of the population that the primary objective at the moment is to defend the country, and everything else is secondary. Well, if we take that away and there is peace with Ethiopia, those secondary things will become primary needs for the Eritrean population. He is in a “doomed if you do, doomed if you don’t.” situation. This explains why there is no official response from the Eritrean government as of yet. They thought, they achieve their goal by blocking any development investment to Ethiopia (especially on the development of Blue Nile and its tributaries) & creating/supporting secessionist [narrow nationalist] groups like E.L.F. (the Eritrean Liberation Front) and T.P.L.F. (Tigrean People Liberation Front) rebels easily. In 1990s the world geopolitical condition became ideal to dismember Ethiopia (by creating the largest and most populous land locked country) and bring a “neocolonialists’ agenda” friendly ethnocentric puppet governments in political power. Soviet Union was crumbling, the communist Derg regime of Ethiopia was losing its iron grip, UN office was occupied By an Egyptian Mr. Boutros Boutros Ghali & Mr. Herman Cohen was serving as United States Assistant Secretary of State for African Affairs from 1989 to 1993. The destructive projects of Neocolonialists (as crafted by Italian invaders in 1880s & during WW2) division of Ethiopia with language based ethnic boundaries, instigating government sanctioned ethnic strife, looting, ethnic cleansing and genocide complacently armed, trained, financed and supported by the Western hypocrites and neocolonialists continued for over two decades. Now the fruit is wide spread and ripe! One thing is certain from the track record of T.P.L.F. and Eritrean reclusive mafia governments. Any treaty they sign with foreign governments are not transparent (there is no independent media), not debated among Ethiopian or Eritrean concerned political and civic societies (which are intentionally decimated), and not reflecting the national interests of Ethiopian & Eritrean people at all. More is focused, to cling to the political power at any cost and catering to the agendas of Neocolonialists! Oh Mr. Cohen of the then Ambassader to Africa, History will never forge you that you with Meles and Isayas did to the Oromo peoples and their representetives, OLF, you robbed their struggle for freedome, you had a bold hand in the mess b/n the two countrie too, you had better shutt your mouth….. Please stay away from Ethiopia and Eritrea. ´We know that Esaya Afewerk pays you to liaison in his favor, but you will fail time and again. Your article is nothing but another attempt to create a mess. Firstly, it was not Ethiopia who illegally occupied territories in 1998 that sparked the border war. The World has witnessed that Eritrea initiated the war. Badme has Always been under Ethiopian effective administration. Secondly, Djibouti’s port is much closer to Addis Ababa than the Assab port. Thirdly, Ethiopia must regain an access to port. An Eritrea that rejects Ethiopia’s claim for port must face the consequence. Mr. Cohen stay away from this region. A very biased article that completely ignores the facts on the ground. Looks like it was written by one of President Isaias’ advisors. Who cares whether Ambasador Cohen lobbies for Eritrean government or not? Those ppl who love to see peace prevail in East Africa must be open to any suggestions/comments on how to find a lasting solution to these man-made issues between ERITREA & ETHIOPIA. You have to go after the message not the messenger. Do not be fooled by either government. The people of the two countries are thirsty of peace, stability, and the long-lost fraternity and peace of mind. Let’s not give our ears to the bad guys, chauvinists and traditional expansionists, who love grabbing land and sea by force and who do not care at all about the loss of innocent lives in the name of unity. They don’t learn from history. They are condemning the binding and internationally endorsed Algerines agreement. They want to take us back to fire and fury. This will disturb further the historic and the blood relationship of the two people. It will make us more distant than ever, poorer than ever, more hostile than ever. Dear People of Ethiopia and Eritrea, let us not lend our ears to theses bad elites. Note well that these bad elites and their beloved ones are enjoying life at home and outside at the cost of the poor people and the country’s development. A peaceful Ethiopia with its abundant natural and human resources could have been developed easily and swiftly but this was jeopardized because of the centrists. But now we have, left and right, learned enough. We don’t want to hear the aching sounds of guns, painful cries and we don’t want to see displacements and loss of lives because of unjust war ignited by chauvinists among brothers and sisters. Enough is enough. Let’s all strive together to solve the border issue legally and wisely and work hard for social and economic integration peacefully and on equal footing. God bless the people of the two countries.